Hyundai's New Vehicle Test Center At The Nurburgring Track To Start Operating In August! 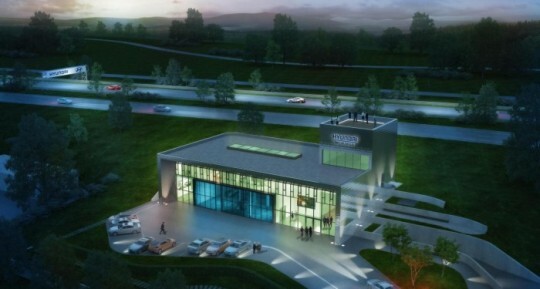 Home > Latest Hyundai News > Hyundai’s New Vehicle Test Center At The Nurburgring Track To Start Operating In August! Hyundai’s New Vehicle Test Center At The Nurburgring Track To Start Operating In August! Hyundai is in the final stages of moving into its new vehicle test center in Nurburgring, Germany. The iconic track will serve as the permanent base for Hyundai, and will be the perfect place to put all of their vehicles through their paces. The test track has become well known for being one of the toughest circuits in the world. The project is expected to be completed by August 2013, at which time it will be ready to meet all of Hyundai’s needs. The center will take up four floors and 3.622 m2, and will include workshops, office space, and a VIP hospitality area. The exterior glass and metallic finish will be one that is totally unique. The new facility will serve as a natural complement to the European R&D facility, located in Russelsheim, Germany, already owned by Hyundai. That particular facility was opened back in 2013 and is home to the company’s European powertrain, tuning and evaluation divisions. The proximity to the Nurburgring facility will mean that each of those divisions will be able to run a greater number of vehicle assessments annually. That includes Hyundai’s extremely rigorous “accelerated durability tests” which can simulate 180,000 km of all condition, sever driving in just a few weeks. The results delivered there provide invaluable data across a number of different parameters. Allan Rushforth, Senior Vice President and COO of Hyundai Motor Europe, said that quality is one of the core values of Hyundai, as it is what most often delivers customer satisfaction. He went on to talk about the Nurburgring test center and how crucial a part it will play in being able to consistently deliver high levels of quality on every vehicle development project. He also said that the ability to increase testing capacity will mean that the customer will truly be able to benefit from improved quality and performance. That additional testing capacity will mean that Hyundai will be able to conduct accelerated durability tests on 11 different vehicles, all while assessing steering, suspension, ride and handling characteristics to produce set-ups suited to the preferences of European drivers.